Italian builder CRN has commented on the launch of its 60m superyacht J’Ade and revealed details of a 74m project currently in-build. J’Ade features a floodable lower deck garage, a sundeck helipad and gym, and styling that Boldrini describes as ‘cutting edge’ and ‘military’. Her delivery is scheduled for spring 2013. CRN’s 74m, another custom project, was also designed by Zuccon. 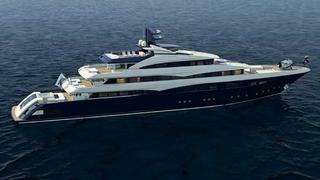 It will become the brand's second largest yacht, after the 80m flagship CRN 129, which is also in-build. The 74m hull 131 will have five decks and will accommodate 12 in five guest cabins and an owner's suite (on an owner's deck), as well as 28 crew. Decor will be by Central Stile CRN. Features include a fold-down beach club, wine tasting area, several balconies and a greenhouse for the owner's Bonsai collection. Twin Caterpillar 3516 engines will offer 2,000kW at 1,600rpm, an estimated cruising speed of 15 knots and an estimated maximum speed of 16.5 knots. The hull is complete and the superstructure is being mounted. Launch is slated for spring 2014.